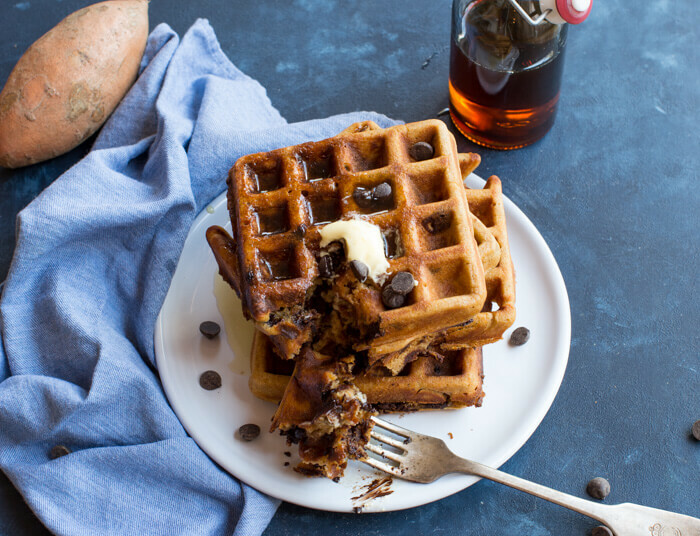 Sweet Potato Chocolate Chip Waffles. Gluten free and so YUM! Sweet potatoes and chocolate for breakfast? Yes please! Today is Parker’s 2nd birthday! Ahhh, how did two years pass by so quickly?! (You can read Parker’s birth story here). And if There’s one thing I know as his mama– he loves breakfast food. 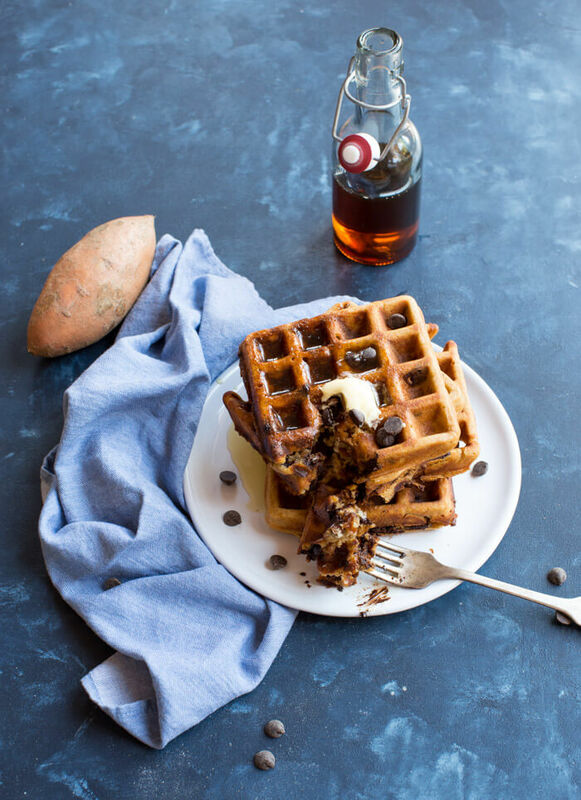 So these Sweet Potato Chocolate Chip Waffles are in order for the big day. And then he sleepily walks over to his high chair and points and at the same time points at the TV because he wants to watch a show while he enjoys his breakfast. It’s a little ritual he has right now, and it just puts a smile on my face because I know this phase and his sweet little -isms won’t last forever. 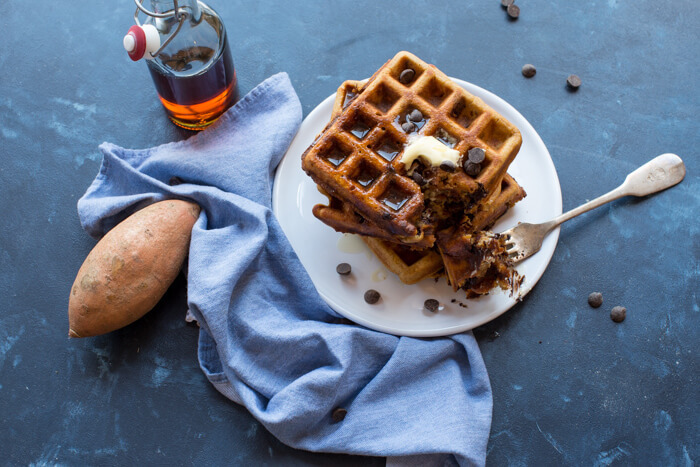 I mean who doesn’t love Sweet Potato Chocolate Chip Waffles for breakfast? 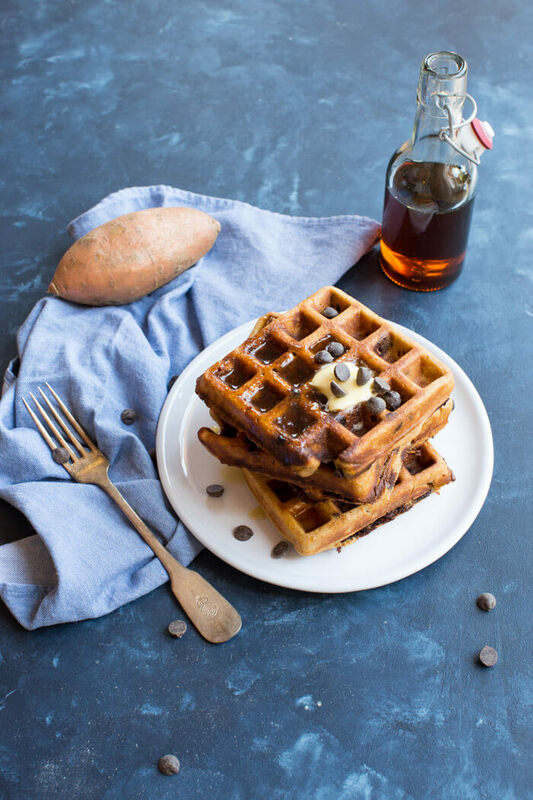 PS– if you love Sweet Potato Chocolate Chip Waffles as much as we do, place them in a freezer bag and keep them on hand for a quick reheat and eat. This little trick makes morning time run smoothy and breakfast lovers happy! Enjoy! Microwave 1 small sweet potato until fork tender. Cut in half, and scoop out the flesh. Mash the sweet potato and measure ½ cup; place in a large bowl. Allow to cool slightly. Into the bowl of mashed potatoes, add kefir, eggs, maple syrup, and coconut oil. Whisk and combine well. Stir in the baking powder, salt, cinnamon and nutmeg to the wet ingredients, and whisk to combine. Next add the flour stirring just until combined. Once all ingredients are fully incorporated, fold in the chocolate chips, and mix well, making sure there are chips throughout the batter. Turn non stick waffle iron on medium heat (or spray with cooking oil). Once waffle maker is full heated, spoon the batter onto the waffle maker, making sure the batter covers the grates fully. Waffles are cooked when the waffle maker indicates, or once a golden brown crust has formed and waffles can be easily removed from the waffle maker. Serve with maple syrup, butter, or your favorite toppings! This is my kind of brunch! These look SO delicious. I definitely want to make them for my family this weekend! Hi Kristina! Waffle are my favorite. I often eat them for breakfasts and sometime for brunch. But every time I cook I can’t stop admiring how great they are! Your recipe is another one in my collection now – thank you so much for sharing it! Aw, Happy Birthday to your little guy! His isms are so adorable! And these waffles look absolutely srumptious! omgeee, I saw these on Insta and they looked sooo goood!! Totally having waffles this morning! These sweet potato waffles look positively divine. Those little squares look perfectly crispy. I think I need to get a waffle maker that works so we can enjoy these! No idea why I’ve never added sweet potatoes to my waffles. I eat them with everything else!